"Oh, Hello" to you and welcome to my blog! 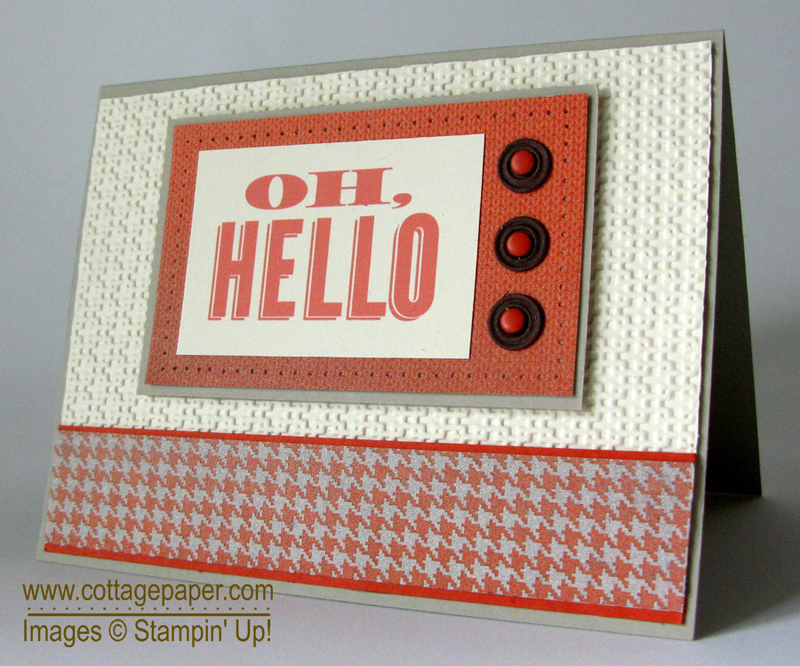 When I was planning my blog I had several ideas for posts and cards to make, Then I got the idea to use the Oh, Hello stamp set for my first post. What better way to greet you?! The only problem was that I didn't have that set and I did not plan to place another order before my blog began. Then it dawned on me that the set might be available as a download in MDS. My Digital Studio (MDS) is Stampin' Up! software to digitally create scrapbooks, cards and other papercrafting items which can then be printed. A large number of both current and retired Stampin' Up! stamp sets, Designer Series Papers, cardstock, ribbons and other elements are available as digital downloads to be used in the MDS software or in other digital applications. You can see videos and learn more about how to use MDS by clicking on the MDS tab just under the above header. I frequently create "hybrid" projects in which part of the card is created digitally and printed and the rest of the card is made with traditional products. The part I print is usually something that normally would be stamped such as a word or sentiment. I looked on the Stampin' Up! website and Oh, Hello was indeed available as an MDS download - perfect!! Here is the card I made. When I conceived this card it was to be a summer card with bright summer colors but somehow it evolved into something else. Does it make you think of the crisp sweater weather of fall? That may be because I used the Sweater Weather Designer Series Paper which is now available in the new Holiday Catalog. I printed the Oh, Hello "stamp" in Tangerine Tango. This is the only part of the original card that remained the same! One of the advantages to MDS is that you can adjust the size of the elements you use. In this case, in order to emphasize the message, I enlarged the Oh, Hello before I printed it onto Very Vanilla cardstock. The card base is Sahara Sand. The Chocolate Chip "buttons" were created with the Stampin Up! Sweet Buttons embosslit and their centers are Tangerine Tango candy dots. Please email me with any questions or put them in the comments below!